It seems cheesey when we think about it, the whole ‘what’s your star sign?’ first date question…or harking back to our teenage years when we’d try and find out the singer from Bros’ star sign so we could look up our compatibility! It all seems like a bit of a fun. But sometimes, people take astrology VERY seriously. People have been known to dismiss whole relationships at the very start, just based on their Zodiac compatibility. Does it have any true weight behind it? Who knows…I guess (as with anything) it all comes down to personal choice and as I said…it should always just be a bit of fun. If you are curious, then you could always use this list to see where you rank in lurrrve stakes, in terms of astrology. Are you the perfect companion? Or an absolute nightmare!? Find out below! Straight in at the top spot, we have the Sagittarian ladies! These fire sign ladies are known for being selfless and always wanting the people in their company to be feel loved and appreciated! She wants to see you succeed and often puts the needs and happiness of others before her own! Well done, Sag ladies, you’re the catch of the day! Shy, sweet and trustworthy, the pisces girl is certainly worth all the work that a man is willing to give to her. She is someone who can always be relied on. She’s sensitive, careful, attentive and very intuitive when it comes to how her partner is feeling. She’ll always be there for you when you need her… awww! A very head strong, determined and hard working woman, she’ll give you her all in the relationship. Yes, she may be a little intense and want everything to be perfect, but it’s a sign of her total dedication and commitment to a partner. She’s someone to be thankful for, as she will enhance your life in ways you didn’t even think were possible! She’s your very own Wonder Woman! 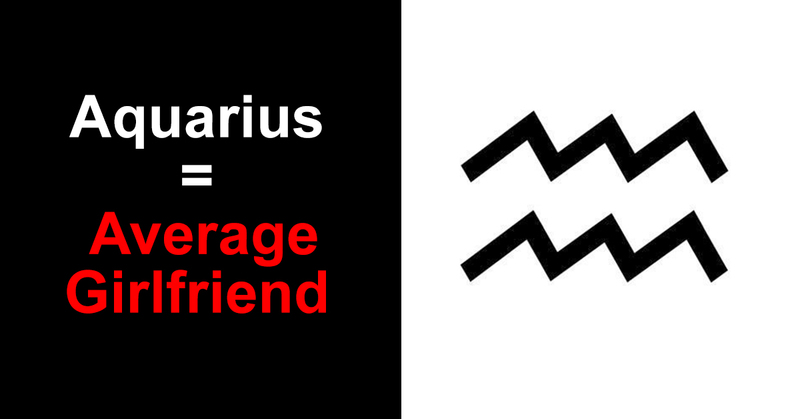 Often known as one of the most kindest people in the zodiac, you can’t go wrong when deciding to date a Libran Lass. They’re generally very positive and have an infectious good nature that rubs off on people. Just make sure you’re careful with what you say to her! She can have a tendency to be very sensitive…and expect the silent treatment, as she won’t be quick to tell you what’s wrong! Like the twins depict, Gemini can be a bit of a Jekyll and Hyde character. However, the positive and negative sides are often well balanced. You will have fun with a gemini girl, but you will also go through your fair share of hard times too! She is mostly fun, energetic and loving…but don’t unleash the beast within, or you may regret it! If you’re looking for a happy middle, then an Aquarian lady is your best bet! She probably isn’t going to be amazing… but she isn’t going to be a nightmare either. They’re quite eccentric, but they’re loyal and loving. Although they certainly aren’t everyone’s cup of tea! Leo lassies often set the bar way too high for relationships, leading to unrealistic demands on their partner. They want the rom com, fairytale princess romance…and sadly, life just isn’t like that. Cancerian women are the sweethearts of the zodiac, selfless, kind and loving…they often get their kind nature taken for granted and end up hurt and heartbroken on a regular basis. This understandably, often leads to them eventually putting up some emotional barriers, which can make it hard for potential partners to get to know them and open up. Taurus totty often don’t even want or need a relationship to begin with. They hate the idea of falling in love and having to be committed to one person. They don’t like to be tied down and are often known as huge heart-breakers, so watch out fellas! Needy, clingy and intense…the Arian woman is sometimes, just WAAAAY too much for most guys to deal with. She’ll want to do everything with you straight away & will constantly try to rush you into things that you’re probably just not ready for yet. Her intensity is her downfall, she wants everything done yesterday and she won’t care how you feel about it. Snobby and difficult to please…Virgo ladies aren’t the best people to be in a relationship with. They will place unrealistic demands on their partner, without thinking logically. They’re very honest people, but most of the time, they take that to the next level… and will have no problem belittling their man in front of others and making their partner feel bad about themselves. Out of all women you could date, Scorpio is the one to be most feared! If you find yourself falling for a scorpio seductress, then be on your guard! They often have no thought for their partner’s feelings and are often selfish, coldhearted and controlling. Duck and cover guys…run for the hills!